The headliners of this year's Warped Tour were Tiger Army. The band's fourth and most ambitious album, "Music From Regions Beyond" (Hellcat Records) is now on store shelves and is definitely worth a listen on a hot summer night. It's the first release from the band in three years and has a markedly different feel than the group's earlier records. The album was put together (and most certainly impacted) by producer Jerry Finn whose credits include recent records for blink-182, the Offspring, AFI, Pennywise, and Morrissey. Tiger Army's most daring record to date. A great listen but one that may turn off some die-hards fans. The record opens with "Prelude: Signal Return" - an intro track sounds as if it is well underway when we hit play. Fast paced but not yet classic Tiger Army - until the bass breakdown and the familiar credo comes as a chant, "Tiger Army - Never Die!" - welcome to the new record. "Hot Prowl" unfolds like a track from the band's first record in 1999. The wild track sets the plate for "Afterworld" and an appearance from AFI's Dave Havok. The guitar sweeps like windshield wipers across imaginary windshields in "Forever Fades Away." Three tracks (and the album intro) and we have heard four different sounds from Tiger Army - but each has a foot firmly standing in their rockabilly past. My two favorite tracks on "Beyond" come back to back. Call me a 'classicist', but you have to love, "Ghosts of Memory." It feels like home - and based on the song, I think that's what singer Nick 13 (born Nick Kearney - now Rockabilly Legend personified) had in mind. Next comes "LunaTone" - a track which could be the bridge between the old and new T.A. - it sounds like a classic track, surf ballad and maybe a little indicator of where the Army is headed in the future. It's certainly less gritty but more of a challenge musically. It should be interesting of the die-hard fans come along for the ride. From here on in - it's Tiger Army's experiment and we are along for the ride. We hear elements of Finn's work with Morrissey (2006) on the Tiger Army track "As the Cold Rains Falls" - a most unlikely song that is quite good in all other respects. "Hechizo de Amor" is a love song performed in Spanish! "Spring Forward" is a return to form and the album closes amidst southern cypress trees leaning into a slow breeze: "Where the Moss Slowly Grows." All in all, Tiger Army's new album was very enjoyable to listen to - but it may not be what you expect. Time will only tell what this daring album does to their place in the industry and their legacy amongst fans.Definitely worth picking up! 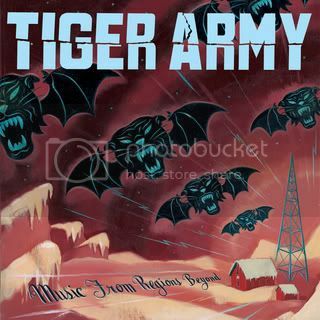 New Music from "Music From Regions Beyond"
The title of the new Tiger Army record, "Music From Regions Beyond" is lifted from the script of the Seance Room scene of the Haunted Mansion ride at Disneyland.